From dull and dark to happy and bright on a tiny budget. A super affordable kitchen update. My favorite kind! The budget is small when you're working with an investment property, and our new airbnb property is no exception. 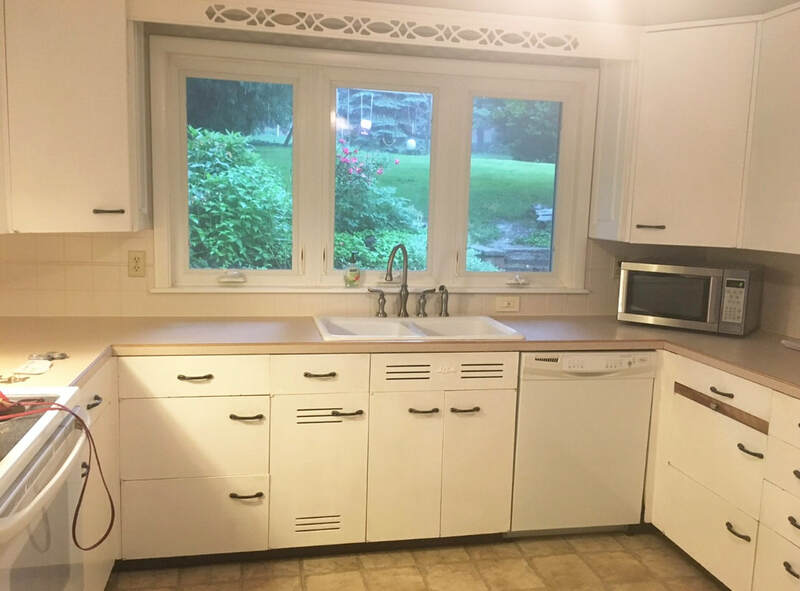 We purchased this 100 year old beauty after someone had updated it to flip it, but the kitchen was an update from the late 90's. Bad lighting from a ceiling fan that was too large, dark cabinets and tiled countertops were a dark khaki green. To get this look I used only 3 different paints and changed out the lighting. 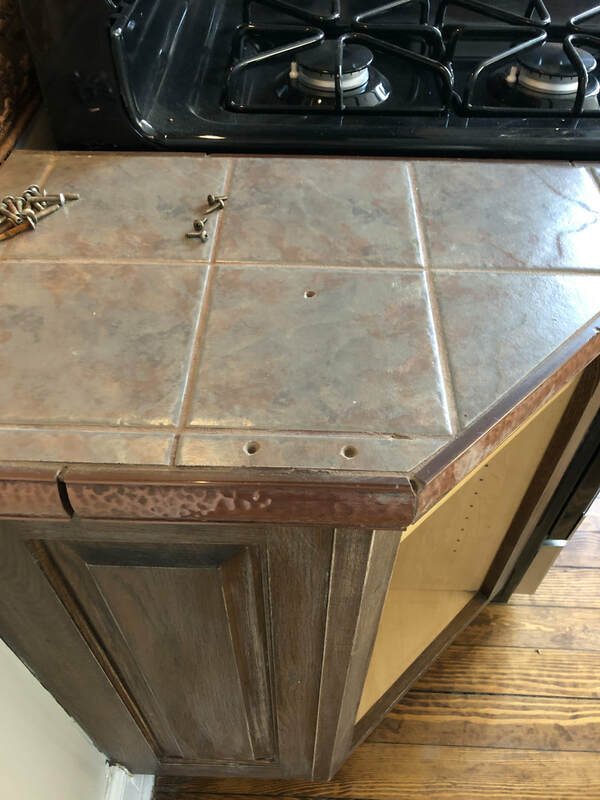 Paint #1 (in two colors), was for the cabinets, which are painted with Valspar cabinet paint from Lowes, and I used the same paint to go over the copper colored backsplash. OH wait! I used 4 paints! I forgot the primer. I did a light hand sanding on the cabinets and used a primer first. ​Paint #2 was a tub and tile paint I used to go over the dark tile and grout (wear a respirator!). We've used this many times, including redoing entire tubs, and it works great! Chris installed the new school house style lights and it made a huge change! I've used this style in other spaces, including our flip house. They are a "vintage style" but look great in more modern spaces too. 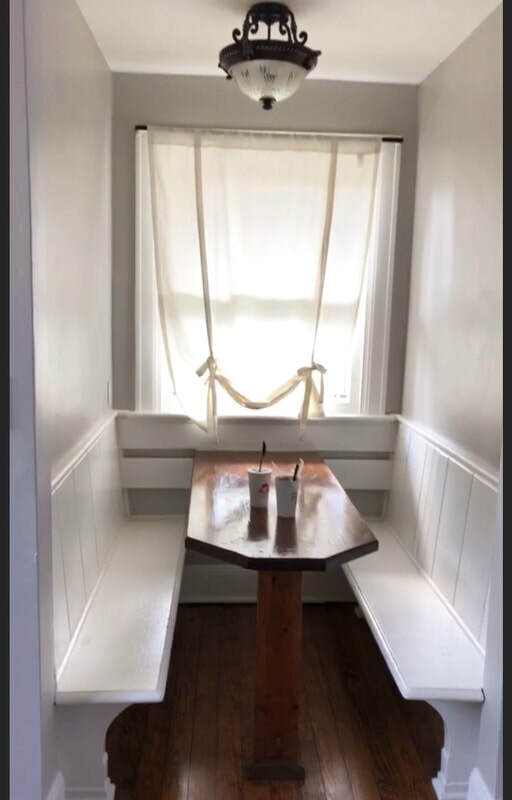 An update to the little breakfast nook, adding bamboo shade and more open airy light made from hemp twine, make it more casual and I think our Airbnb guests will enjoy eating there. I think the changes are simple but make a big impact and now I"m on a mission to figure out where I can use that blue in my house. There's got to be a wall somewhere! I added the schoolhouse style lights to my Amazon Favorites shop, under "renovations/diy". Just select "Amazon Faves" at the top of this page! Well, we did it! 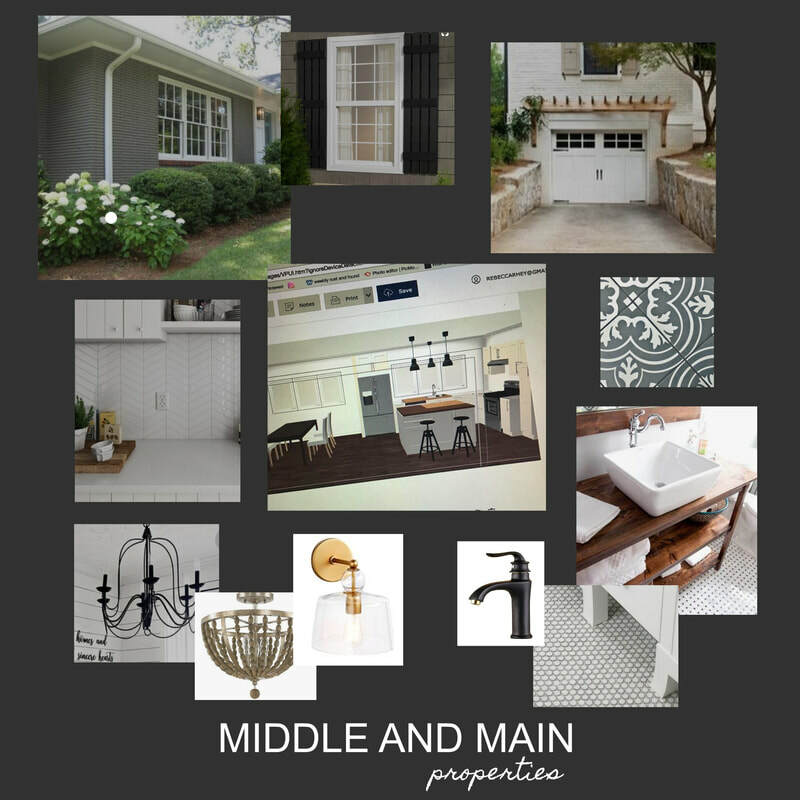 We bought, renovated and listed! We also argued, laughed, problem solved, sweat, designed, cleaned, hauled and yes, we plan to do it all again next year. Chris and I are excited to share more of the journey and plenty of the not so fun details. An exterior paint job in SW Dovetail, and a major facade change with the bedroom windows brought the flip house out of the 50's, but my favorite exterior project was the addition of the arbor over the garage. This added some charm and interest to an otherwise simple ranch. Some Clematis vines next summer would be the cherry on top! 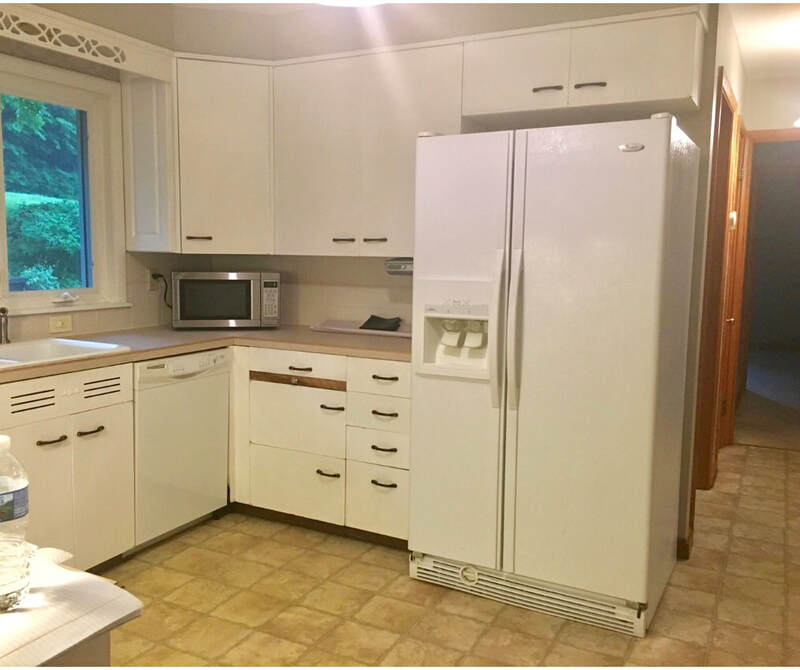 But how did we get from this tiny kitchen full of metal cabinets to the finished product? 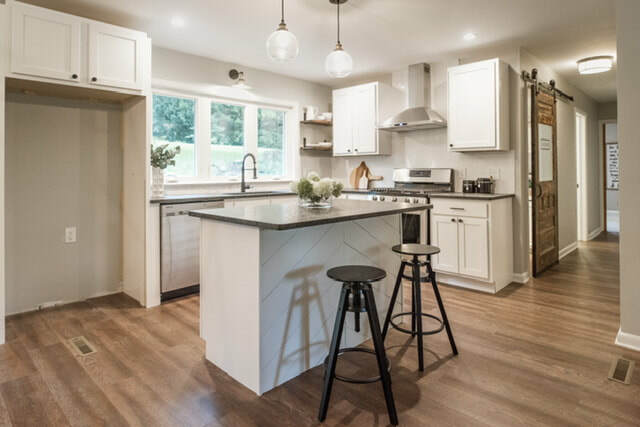 The kitchen and dining are also where we ran into our first "life lesson of flipping" about what contractors you hire, how you pay them and who to trust. An expensive lesson involving an electrician who us left hanging was finally resolved with the assistance of a different local electrician that stepped in to help us get it done. I guess it's good we are learning as we go, but this was an expensive lesson. From paper and pencil, to the real deal. A good feeling for sure! 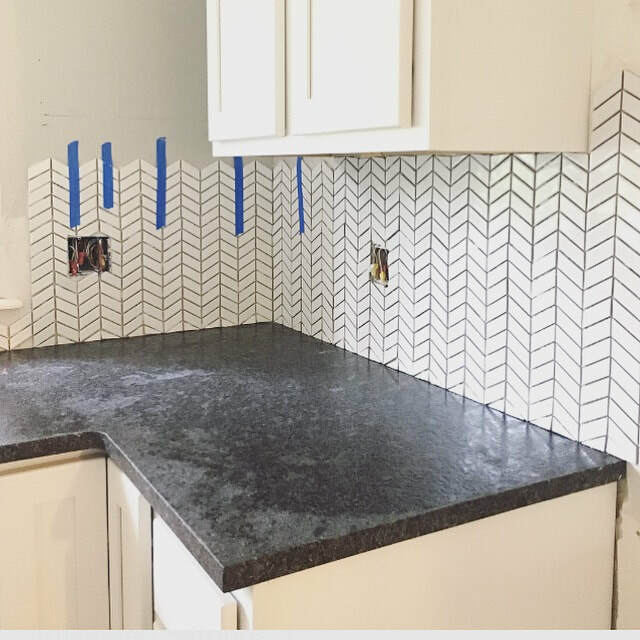 I like doing tile, and after finishing the chevron tile kitchen backsplash, the plan was to create a shiplap on the back of the kitchen island that would mimic the chevron. Turned out great! We selected a charcoal colored granite with a leathered finish, which gave it almost a concrete look. Finishing touches of black hardware and lighting with both black and gold accents helped to pull everything together. 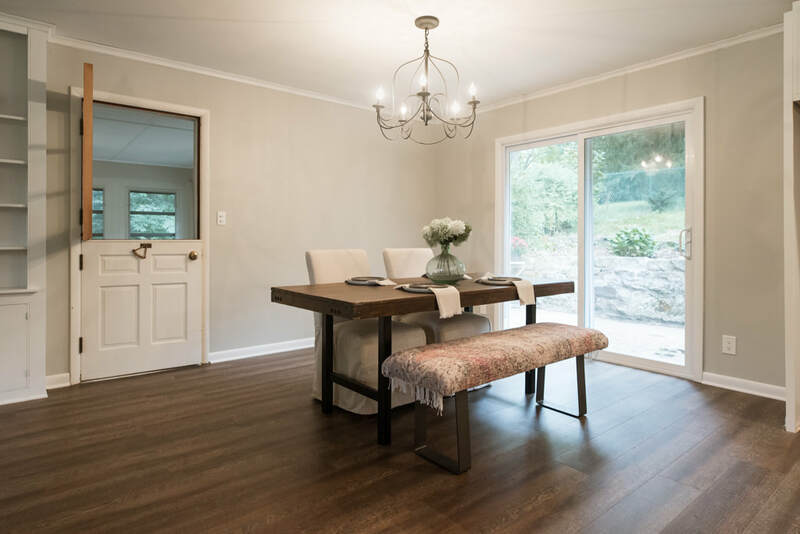 The addition of the sliding door, where there was previously only a window, brought the open floor plan home. Now there is even more natural light and a gorgeous view of the back yard and stone wall. As you can see, the difference is like night and day! More light, more kitchen and most of all a beautiful space to spend the days. On the next blog post I'll cover the two bathroom renovations. From gut job to marble and subway tile. Stay tuned!! If there is one topic Chris and I have revisited and talked about for more than a decade, it's renovating houses. We've both enjoyed learning new skills on our own homes for over 20 years, so it made sense. 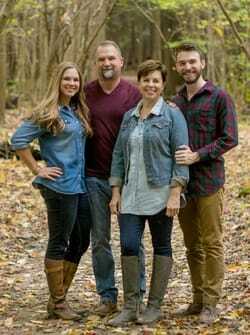 Cameron and Haley grew up and are busy with their own lives, I closed the brick & mortar and began working at a slower pace.... the timing suddenly felt right. The next thing you know we were going for it! So after lots of house searching and a few losing bids, we purchased our first official flip! Last week we did demo, opened up the main living area, and started some exterior work. The list is long with projects to make this 1950's house a stunner! 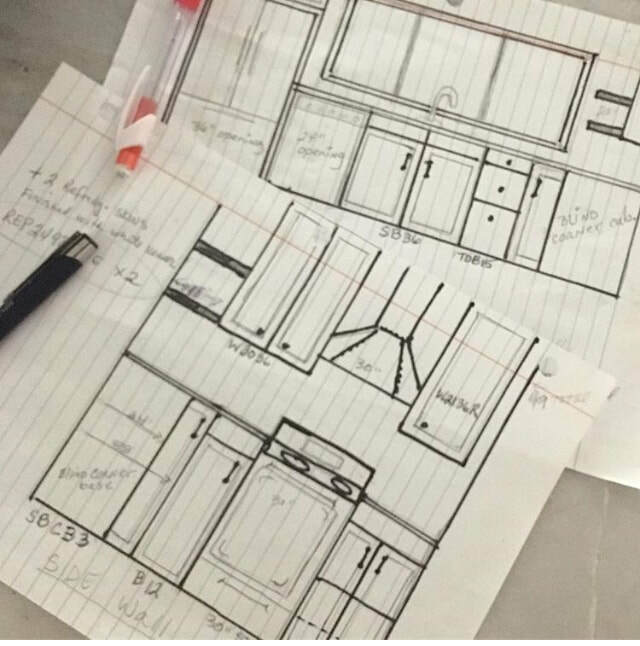 I"m so excited to stretch my design wings a little wider, and Chris is looking forward to making it all happen. You all KNOW I'm so excited to get to the staging part of the process. I plan to fill the house with some of my vintage finds, as well as some custom furniture or lighting pieces. All of those items will be available for sale! Once the house has sold, the unique pieces will be posted for sale. You will also be welcome to pre-purchase them at an Open House (to be picked up after the house has sold). Our summer is all booked! In addition to the day and evening work, giving up or weekends will totally be worth it! We plan to do the bulk of the work ourselves, since getting our hands dirty is something we enjoy. Although, we both admit it's a little harder with each passing year... middle age will do that to ya! We share all the action on our Intagram Stories, as well as posting pics of the work and inspiration for the project on our feed. Be sure to follow us there! Let's go straight to the AFTER photos! If you're anything like me, you like to skip right to the good part. The before look, details and cost friendly tips to follow. Fresh. 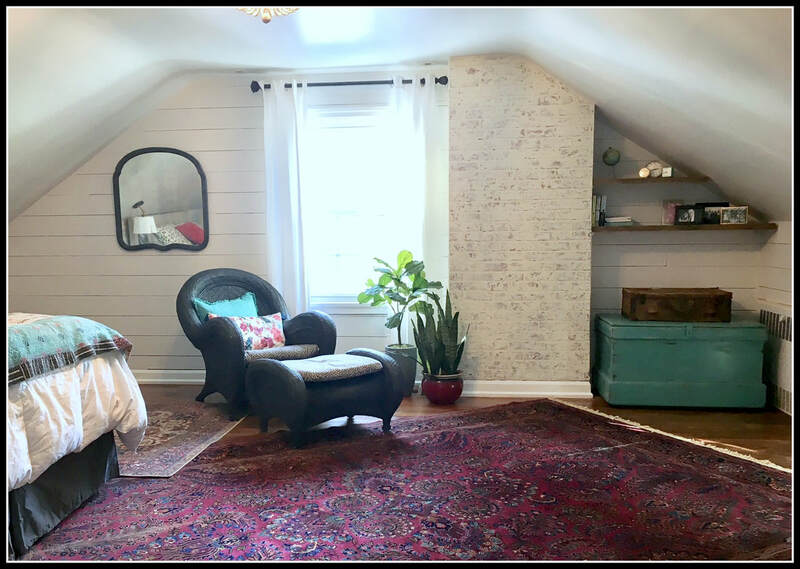 That's how I would describe this guest room makeover. 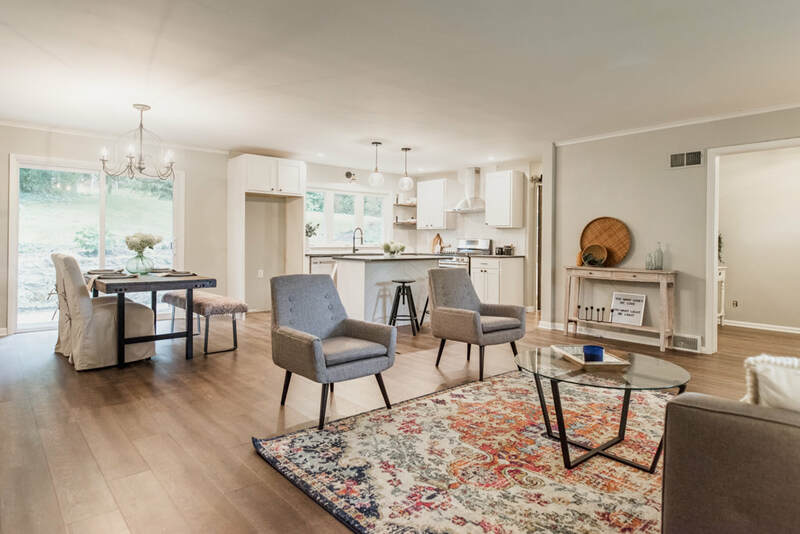 Even though many things in the space are vintage or vintage inspired, there are other touches that bring a more modern vibe along with the light colored walls that keep Fresh in the forefront. Making a plan come to life. The guest room has remained untouched since we moved in three years ago and I've been dying to take it on. Starting out with a 3D design program to see my vision come to life was fun to do (and can be addictive!). 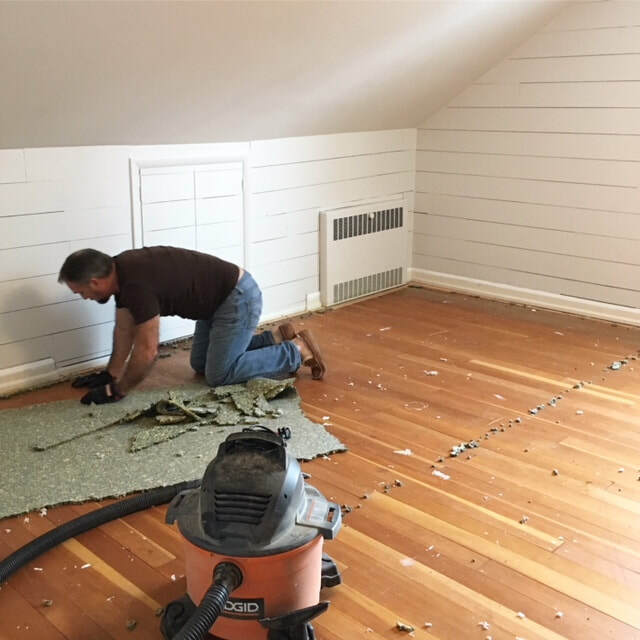 The shiplap went up fast and was completely done in two days. It's made of 6" planks of 1/4 plywood or underlayment. 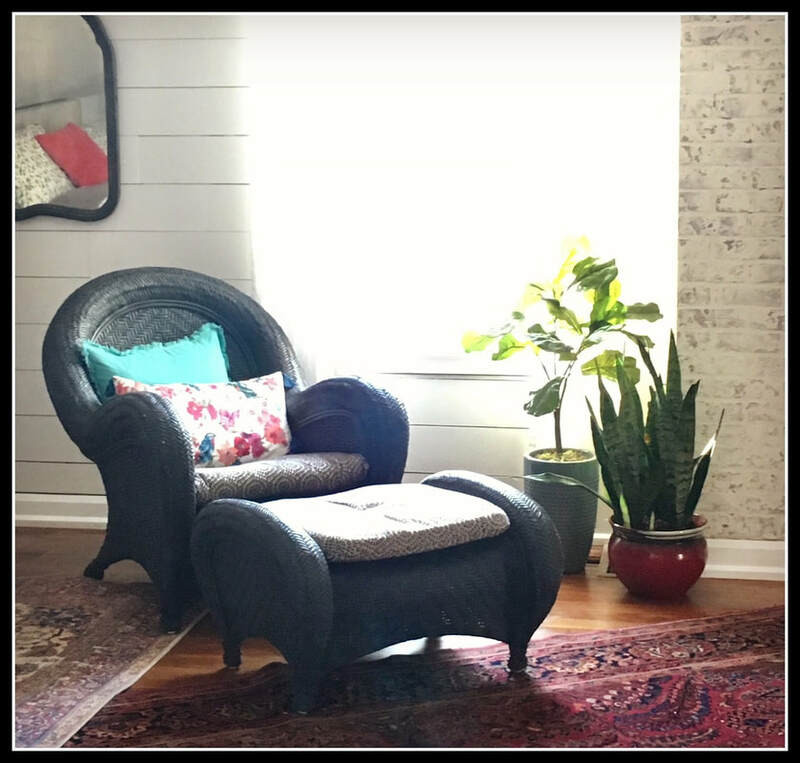 If you haven't seen the blog post about my "faux chimney", you can see it here to get all the details about making this German Schmear architectural feature using brick paneling. Next came the floor. The carpet was pretty gross but underneath was some hardwood just waiting to take center stage. After sanding down lots of paint and the old finish I added Special Walnut stain and two coats of polyeurathane. 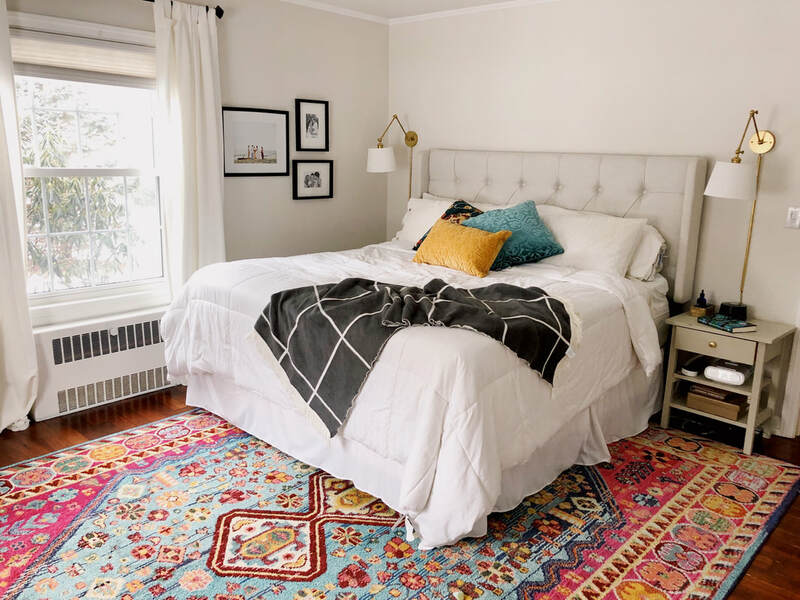 Pulling off a budget friendly makeover. The budget for the bedroom was small. 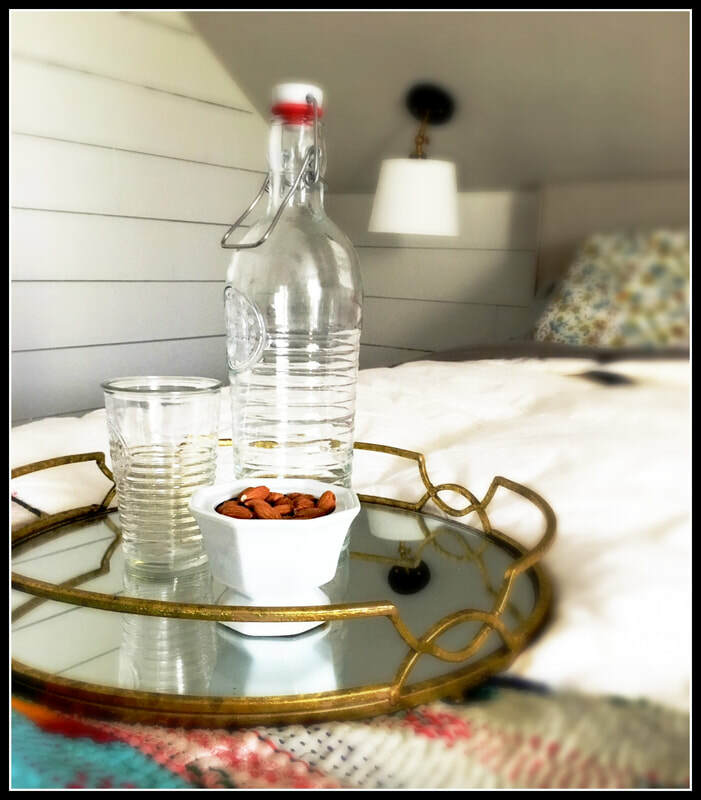 I'm re-posting some of the photos to show you where many of the pieces and decor came from in hopes it can inspire you to jump into something you've been putting off because of a limited budget. Most things were found at flea markets, thrift stores or discount stores and web sites. Collecting things for a makeover takes time. Write down your ideas for the space you want to freshen up so you can start a list of items you may need. Visit local thrift stores for small decor items, search Craigslist or LetGo for larger pieces, and then fill in at discount shops or hit up Amazon for that one elusive splurge. For me that was the ceiling fixture. I knew what I wanted, it was just a matter of waiting it out to go on sale, and it finally did. Now I just wait for a house guest!